Dragoons are classified as cavalry units, but they are also capable of dismounting and fighting as light infantry. The signature weapon of the dragoons is the carbine musket. They also carry sabers and pistols. Very occasionally dragoons make use of the musketoon. They are organized in companies of 80 to 100 men with 12 companies in a full-strength regiment. In periods of war or hardship, regiments are rarely at full strength. One favored dragoon tactic is to approach the enemy at a trot, discharge their carbines, and then draw swords or pistols to engage the enemy. They also sometimes approach the enemy, discharge their firearms, then retreat to reload, and approach again. The lack of accuracy of the carbine limits their effectiveness at long range. Dragoons are excellent units for deployment in heavily forested terrain where the limited range of their weapons is not as much of an issue. Sometimes called cuirassiers after the cuirasses (breastplates) they wear, these descendants of the chevalier are the shock troops of the modern Japethic military. They are big men riding on big horses, and their plumed helms and shining cuirasses make them all the more intimidating. Heavy cavalry ride close in line, boot to boot, three ranks deep, creating a wall of horse, steel, and death that sweeps across the battlefield at terrifying speed. Their charges can shatter an enemy's line and poorly trained militia flee in terror before the pounding hooves. The cuirassiers are the most prestigious part of the army and the officers are appointed from the high nobility. They are organized into battalions of 400 to 600 men. Cuirassiers are armed with a heavy straight-bladed sword designed for slashing and being held straight armed during a charge like a spear. While they are armed with pistols, they are melee fighters and do not rely on firepower except to protect themselves when grazing their horses. 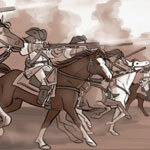 The invention of the socket bayonet has given infantry a strong weapon against charging horse and obviated the need for pikemen to protect the musketeers. However, a well-timed charge can still make the difference in a battle. The heavy cavalry is particularly favored by the Morantines, who constantly seek the gloire of breaking the enemy's line and turning the tide of battle. The light cavalry of Japethe are commonly called carabiniers, as they were originally issued carbines. With the advent of the dragoons, the light cavalry changed armament to a pair of flintlock pistols which they fire at close range before drawing sabers to finish the charge. On the battlefield, the carabiniers have shed their armor over the years to gain speed. The riders are still issued breastplates, but they are only used during parades and ceremonial functions. Instead, the carabiniers wear leather waistcoats and plumed helmets. Their horses are unarmored except for a steel boss to protect the chest. The carabiniers fill the role of a fast, lightly armored cavalry in the Japethic military. They are particularly good at flanking an exposed line or routing artillery, which cannot adjust their range fast enough to keep up with the fast-moving carabiniers. They are sometimes deployed as screens for the heavy cavalry but rarely as scouts as the dragoons serve that purpose. Light cavalry do not have the punching power to attack an infantry line straight on and scatter if charged by cuirassiers. The carabinier have the highest number of female members of any class of unit in the Saronnan military. In addition to the practical benefits of women being lighter and having a lower center of gravity, noble women are drawn to the light cavalry because of the legacy of Jaqueligne de Chantillac. This chevalier from a minor noble family rallied the nearly defeated Saronnans to repeated victories over Morante in the Wars of Unification in the 12th Century. Her impeccable horsemanship, gallantry, and valor won her the admiration of the nation and the emulation of generations of young women. Line infantry is the heart and soul of the modern Japethic army and takes its name from its basic formation -- a line of musketeers standing shoulder-to-shoulder in ranks 2 to 4 deep. Line infantry from Saronne is formed into battalions of 500 to 800 men (and some women, though most gravitate to the cavalry). With the invention of the bayonet, line infantry is capable of withstanding cavalry attacks and provides the anchor for the army on the battlefield. Line infantry most often operates in a line or a column. A column is useful for rapid movement down roads or into position, but leaves the battalion exposed. Movement in a line formation presents a strong front to the enemy but is very slow to move without breaking formation. The musketeers also form squares as a deterrent against cavalry attacks. Line infantry battalions are given colorful standards and bright uniforms so that they can distinguish friend from foe on the smoke-filled chaos of the battlefield. While fighting in a line, the musketeers fire volleys. The effect of the massed shot is like a giant shotgun going off. While the individual shots might not be accurate, the cumulative impact is enormous. Line infantry can be ordered to have each rank in the line load and fire a volley separately, creating a near-continuous rate of fire. Another common tactic is for a battalion to release a single devastating blast and alternate fire with a paired battalion. Line infantry excels in the open battlefields of Japethe, where massive sweeps of regiments through the fields and meadows of the Old Country can keep order and support each other. The effectiveness of the line is nearly eradicated in the deep forests of Everique. The narrow trails and heavy foliage force the battalions into column formation, making them ripe for ambush by the natives or other colonial powers. Many colonial battalions have abandoned line tactics to adopt the “Aradien style” of warfare.